The saffron (Crocus sativus) is a small herbaceous plant belonging to the family of Iridaceae, and the part that is used are the stigmas, which produce the expensive powder used for cooking. The word “saffron” derives from the Arabic word “za’faran” which means “yellow”; in ancient times it was also used by the ancient Egyptians for the composition of dyes, perfumes and oils. The saffron plant blooms during winter and its stigmas, after they have been collected, are dried and reduced in the classic dark yellowish powder which will then give the yellow color to the famous risotto. Saffron is used not only for culinary purposes, but also for healing purposes; the Arabs were the first who found out these properties, and, among all, the one to induce good mood (saffron was considered a natural antidepressant). In Italy the major areas in which saffron is cultivated are Umbria, Marche, Sardinia and Abruzzo. The saying “Worth its weight in gold”, given the high current price, fits particularly well with saffron. For centuries, thanks to its high consumption, it was one of the principal means of trade with the East, and for this reason it is was nicknamed “red gold”. The high economic value of saffron is mainly due to the manner in which it is produced: in fact, all operations to collect it and reduce in dust are carried out by hand without the use of any machine. 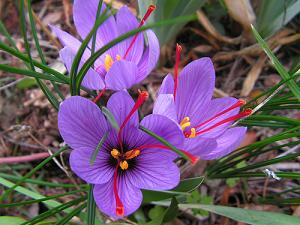 It’s interesting to dwell on the fact that to obtain one kilogram of saffron you need to collect 150,000 flowers! Saffron has been regarded since antiquity as a substance with aphrodisiac properties for men, while for women it was used as abortive substance, if taken in large doses. Putting a pinch of saffron powder in a cup of water, bringing a boil and adding a teaspoon of honey is an excellent anti-stress and digestive infusion; drinking in the evenings helps the sleep. One of the major producing regions of saffron is Abruzzo, specifically in an area of the province of L’Aquila: most of the precious powder produced in this area, however, is exported abroad. Unfortunately, in the last century, the space used for the cultivation of this product has been greatly restricted, thus leaving room for the saffron coming from countries such as Turkey and Iran, which have a plant of lower cost and quality. According to recent studies, saffron seems to have different properties and benefits for human organism, the properties of its ingredients have beneficial effects on the part of the nervous system responsible for the mood and it has been tested in a clinical setting in individuals with mild depression, giving positive outcome. The properties have proved useful even in the case of the typical symptoms of PMS such as mood swings and nervous tension. Even the memory and the learning ability are benefiting from the assumption of the precious powder. We should add, however, that the saffron powder is rich in calories, in fact, each 100 gr. corresponds to 310 calories. As with all types of food, it is recommended to be careful, because 20 grams of saffron all at once can be lethal! Indeed, for a pregnant woman, the intake of 10 grams of saffron can cause abortion. The ideal dose that should never be exceeded is 1.5 grams per day.